"10 DAYS AT SEA tells the story of the rescue ship Aquarius and its days stranded with 630 people on board following the decision—by Italy and Malta—to close their ports to refugees and migrants rescued in the Mediterranean. The grueling journey became the symbol of Europe’s discord over migration and sparked a complex debate over human dignity and Europe’s capacity to cope with the influx of refugees and migrants coming from the Middle East and Africa. 10 DAYS AT SEA—which was entirely shot on an iPhone —is an intimate portrait of some of the men, women and children rescued by the Aquarius. And an attempt to put names and faces to statistics." "Over the past three years, I've reported on migration from different parts of the world. I covered the War in Syria and its devastating effect on millions of people forced to run away from home to survive. I reported from Venezuela where widespread poverty—and hunger—have been pushing people to cross borders. And I reported from the San Blas Islands, in Panama, where the Kuna Indians are at risk of losing their territory—and part of their culture—because of rising sea waters as a result of climate change. But the one story I had yet to tell was the closest to me: the risks taken by thousands of people crossing of what is now known as 'the world’s deadliest migration route.'" "My main objective with 10 DAYS AT SEA was to tell the story of what happened aboard the Aquarius while politicians bickered over how much/little EU member-states had done to help solve Europe’s migration crisis. During the entire process of filming and editing the piece, my number one priority was to give a voice to the people who hadn’t been invited into the debate that was set to shape their destiny. Ordinary people—like you and me—with ordinary dreams as aspirations. People who had risked everything for a better chance in life." "I believe our breakthrough moment happened the day my iPhone pictures made headlines all over the world—shortly after Italy decided to close its ports to the Aquarius. There and then we understood the magnitude of the story we had in our hands. But also the power of that affordable piece of technology that has been transforming our world and the way we see and learn about each other." "I was live on Euronews every day with updates on the situation. But I also used social media—Twitter and Instagram—to reach a wider audience and to interact directly with viewers and political actors alike." "The entire 10-day-coverage was a challenge as I was solely responsible for filming and editing all reports, as well as conducting interviews and producing live updates on TV and social media. It was also important to keep a certain distance from the story, but because I was embedded in it for 10 days it was virtually impossible to ever ""turn-off."" As for the most rewarding moment – I believe it was to visit some of the migrants and refugees nearly three months after disembarking and having them explain how they felt about their story making international headlines. They told me they didn’t feel exposed. But empowered. And that was precisely the idea." 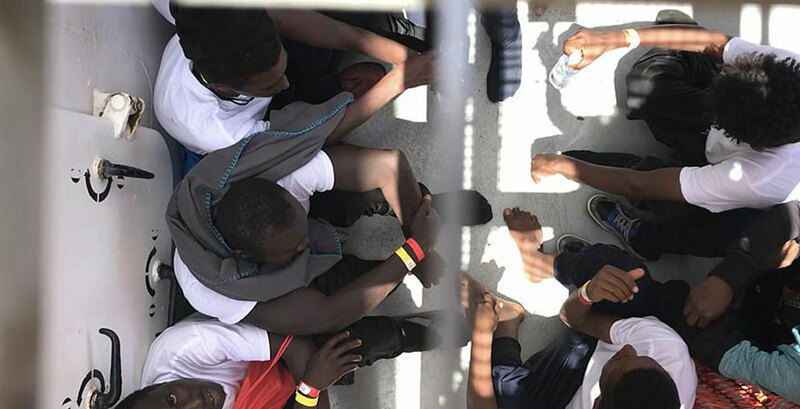 "The experience aboard Aquarius taught me about the power of technology in giving voice to the voiceless—and the power of social media in gathering the largest audience possible to hear what they have to say. It also taught me about resilience—and how much human beings are capable of enduring when difficult things happen to them. But above all, it taught me compassion and empathy since staring into the eyes of a vulnerable person is more daunting than we actually think—it confronts us with what would happen to us if we found ourselves reliant upon the goodwill of others. It is both a powerful and terrifying experience."